The Vonets VAP11G WiFi adaptor comes in two flavours. The original, which uses a weird custom protocol and a setup program that only works on Windows XP... and the shiny new revised that is a proper sort of gateway, has its own IP address, and a web-based configuration. Configuration will probably need to be done on a PC, or perhaps a tablet? The Vonets makes heavy use of scripting. That said, it is possible to get some information out of the device using NetSurf. Enter your login credentials. By default this is, surprise surprise, admin and admin. Then click the button on the right. 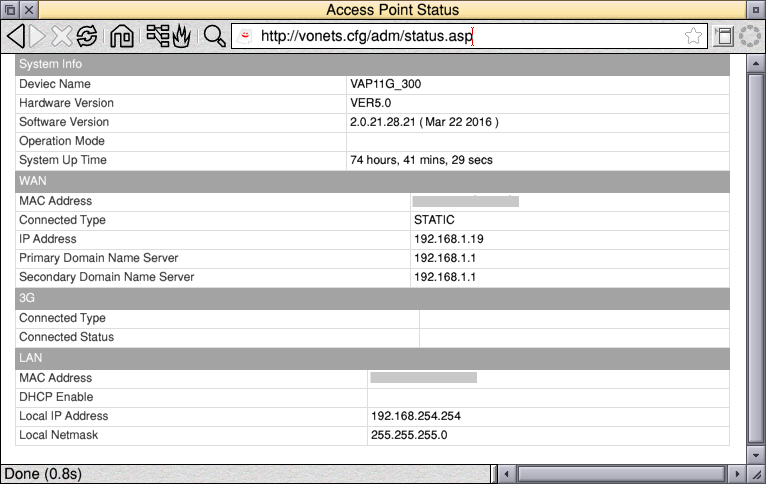 To see what hotspots are available (and/or signal strength), go to http://vonets.cfg/goform/get_web_hotspots_list. The "get_web_hotspots_list" will always perform a scan to see what hotspots are available. If you just want to see the results of the most recent scan without looking again, suffix '2' (ie get_web_hotspots_list2). When you're done, you should go to http://vonets.cfg/goform/quit to log out (only one login at a time is permitted). The response will be a rather appallingly translated "You are already quited"! If this happens, you'll need to power-cycle. Validation Are you real? Please type 80826 backwards.